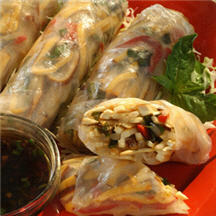 The delicious recipe for vegetarian spring rolls is compliments of cookbook author Ying Chang Compestine. Heat canola oil in large, nonstick skillet over medium-high heat. Add garlic; cook, stirring constantly, for about 30 seconds or until fragrant. Add tofu; cook, stirring frequently, for 2 minutes. Turn off heat. Stir in sunflower greens, basil, bell pepper, sweet chili sauce, seasoning sauce and sesame oil. Soak one sheet of rice paper wrapper in warm water for about 1 minute or until soft. Transfer wrapper to a dry cutting board. Arrange 2 tablespoons filling in an even horizontal mound just below the center of the wrapper. Tightly roll up the rice paper to form a tight cylinder, folding in the sides about halfway, as you would to form an egg roll or a blintz. Repeat procedure with remaining wrappers and filling. Cut each spring roll in half on the diagonal. Serve with Soy and Chili Dipping Sauce. For Soy and Chili Dipping Sauce: Combine 1/4 cup MAGGI TASTE OF ASIA Cooking Soy Sauce, 2 tablespoons rice vinegar, 1 1/2 tablespoons finely chopped green onion, 1 tablespoon MAGGI TASTE OF ASIA Sweet Chili Sauce and 1 teaspoon sesame oil in small bowl.